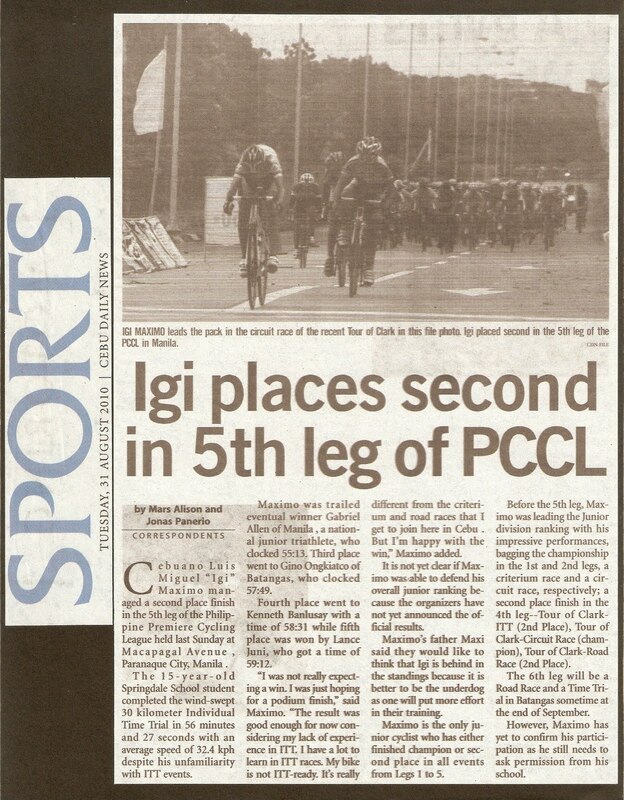 Cebuano Luis Miguel “Igi” Maximo managed a second place finish in the 5th leg of the Philippine Premiere Cycling League held last Sunday at Macapagal Avenue , Paranaque City, Manila . The 15-year-old Springdale School student completed the wind-swept 30 kilometer Individual Time Trial in 56 minutes and 27 seconds with an average speed of 32.4 kph despite his unfamiliarity with ITT events. Maximo was trailed eventual winner Gabriel Allen of Manila , a national junior triathlete, who clocked 55:13. Third place went to Gino Ongkiatco of Batangas, who clocked 57:49. Fourth place went to Kenneth Banlusay with a time of 58:31 while fifth place was won by Lance Juni, who got a time of 59:12. “I was not really expecting a win. I was just hoping for a podium finish,” said Maximo. “The result was good enough for now considering my lack of experience in ITT. I have a lot to learn in ITT races. My bike is not ITT-ready. It’s really different from the criterium and road races that I get to join here in Cebu . But I’m happy with the win,” Maximo added. It is not yet clear if Maximo was able to defend his overall junior ranking because the organizers have not yet announced the official results. Maximo’s father Maxi said they would like to think that Igi is behind in the standings because it is better to be the underdog as one will put more effort in their training. Maximo is the only junior cyclist who has either finished champion or second place in all events from Legs 1 to 5. Before the 5th leg, Maximo was leading the Junior division ranking with his impressive performances, bagging the championship in the 1st and 2nd legs, a criterium race and a circuit race, respectively; a second place finish in the 4th leg--Tour of Clark-ITT (2nd Place), Tour of Clark-Circuit Race (champion), Tour of Clark-Road Race (2nd Place). The 6th leg will be a Road Race and a Time Trial in Batangas sometime at the end of September. However, Maximo has yet to confirm his participation as he still needs to ask permission from his school.